The Fireside is thrilled to present a brand new, live musical celebration featuring the wildly popular Fireside Band led by Fireside favorite Steve Watts! Also featuring a cast of super talented singers, this show is the ultimate rock and roll party!!! The Fireside will be rockin’ with the music of the 50’s, 60’s, 70’s, and 80’s!!! 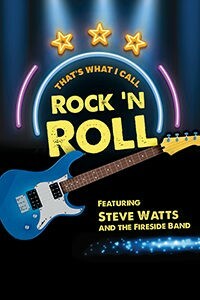 We’ll be paying tribute to some of the biggest rock superstars of all time such as Elvis Presley, Jerry Lee Lewis, The Beach Boys, The Beatles, Jefferson Airplane, Dusty Springfield, Stevie Wonder, Earth, Wind, and Fire, Michael Jackson, Prince, Led Zeppelin, Billy Joel, Van Halen, Queen, Bruce Springsteen, and many more! This is an unforgettable afternoon of rock and roll like no other! An included delicious lunch features Chopped Chef’s Salad, Skinless Breast of Chicken with Bruschetta and Havarti Cheese on a Velouté Lemon Cream Sauce, tri-colored Couscous, Quinoa, Black Beans, and Corn, Fresh Asparagus, Carrots, fresh rolls and Key Lime pie. Minimal walking.